Are you looking for an excuse to get together with your friends? 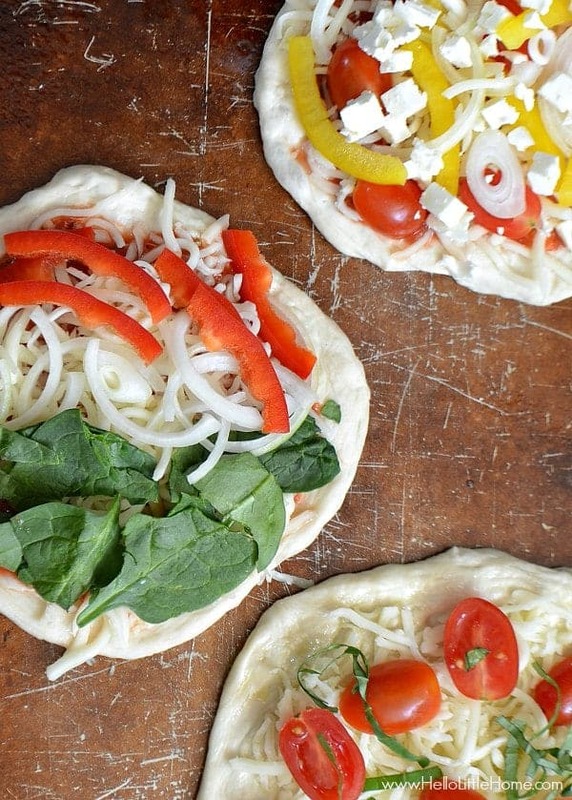 Learn how to throw a homemade pizza party with these simple tips. It’s a fun, easy, and kid-approved! Hi, it’s Ginnie from Hello Little Home! I’m excited to be back and talking about one of my favorite foods: pizza. It’s a meal that I never get tired of. I also love entertaining, and not surprisingly, pizza is often on the menu. 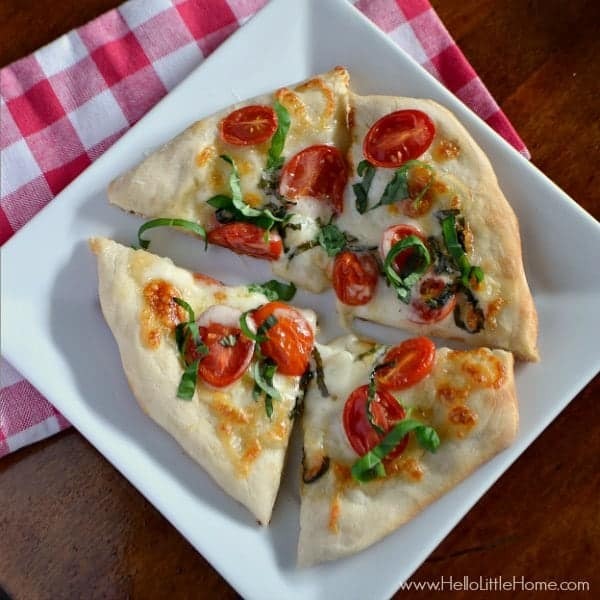 My guests tend to find homemade pizza really impressive, but it’s actually quite easy to make. My number one tip: purchase the pizza dough! Most grocery stores carry fresh dough (I get mine at Trader Joe’s or Whole Foods), and if you’re lucky enough to live near an Italian grocery that sells it, even better. Frozen bread dough also works in a pinch. For my most recent party, I decided to have everyone make their own pizzas. It was a hit, and the kids especially had fun coming up with their own creations! Today, I’m showing you how to throw your own homemade pizza party. 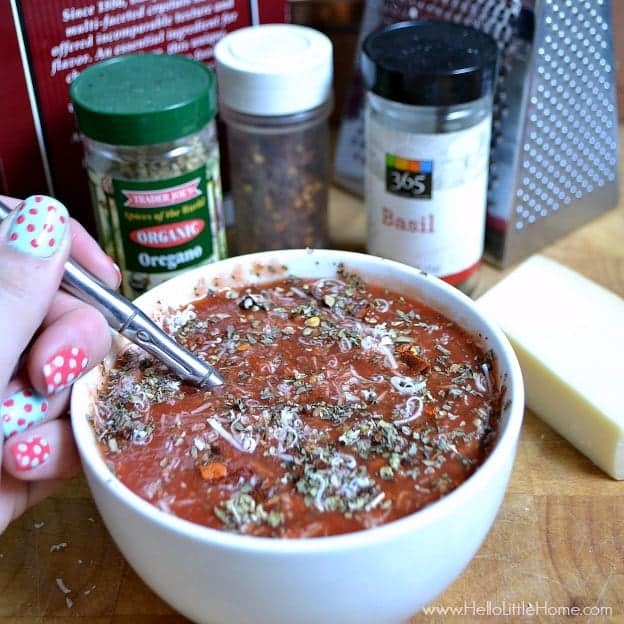 Combine all the ingredients for the pizza sauce in the small bowl and stir well to combine. Season to taste with salt. 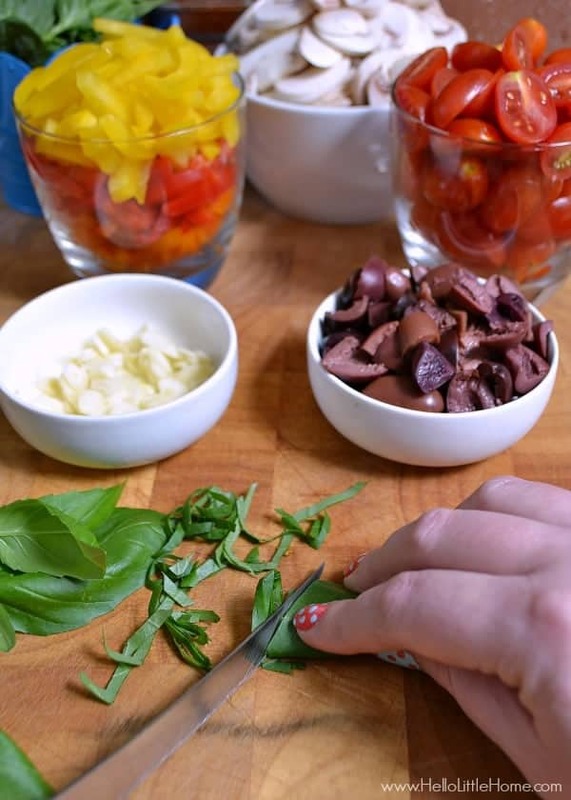 Prepare your pizza toppings next: thinly slice the mushrooms, onion, bell pepper, and garlic; cut the grape tomatoes in half; pit and quarter the kalamata olives; and julienne the basil. Place each ingredient in its own small bowl. Arrange all of the ingredients on your table with the sauce, olive oil, and cheese at one the end. That way, your guests can top their crust with sauce or olive oil first, sprinkle on some mozzarella, and then add the toppings of their choice. I like to give a few suggestions for guests who need assistance building their pizza. 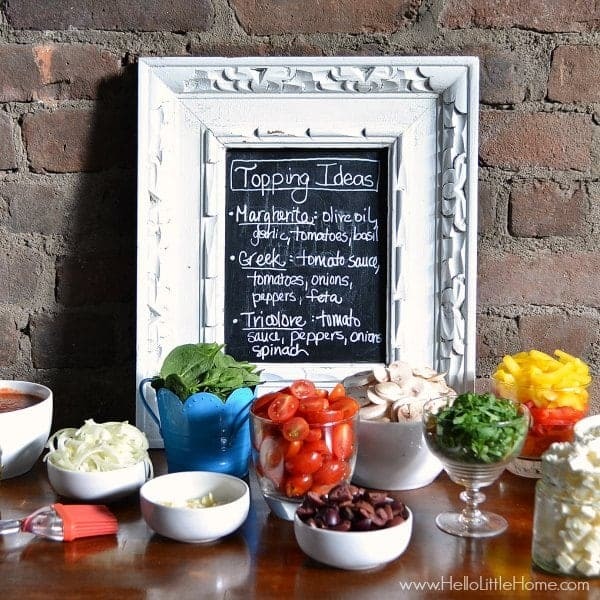 A chalkboard is perfect for this, but you could also type your suggestions in Word, print the file on cardstock, and then place the print in an inexpensive frame. After you’ve prepared the toppings, divide the dough into 10 balls. Gently stretch each ball into a 6-inch round (I use my hands for this) and place on a lightly greased cookie sheet. If the dough is resistent to stretching, let it rest for a minute or two. My apartment is tiny, but if you have more room, place the dough rounds on individual pieces of parchment paper instead of directly on the baking sheet. Once everyone adds their toppings, simply transfer the pizzas (no need to remove the parchment paper) to the baking sheet. Bake the pizzas for 10 to 15 minutes, or until browned on the bottoms and sides. Remove from oven and let cool a minute before cutting. Serve hot and enjoy! Prep the ingredients and roll out the dough ahead of time (refrigerate if needed). You’ll be relaxed during the party and will have more time to hang out with your guests. Sprinkle on a layer of cheese after adding the sauce. This will keep the crust from getting soggy, and all of the beautiful ingredients will be front and center. Bake your pizzas in a hot oven. The dough will cook faster and will have a crispy crust. Have fun with the toppings! Add your favorite cooked meats. Experiment with other sauces, such a barbeque or pesto. Try going with a theme, like Mexican pizza (beans, salsa, pepper jack, olives, cilantro, etc.). Err on the side of having too much of an ingredient, especially cheese. Most peoples eyes are bigger than their stomachs, or pizza crusts in this case! Add a simple salad, brownies, and few drinks to complete the meal. 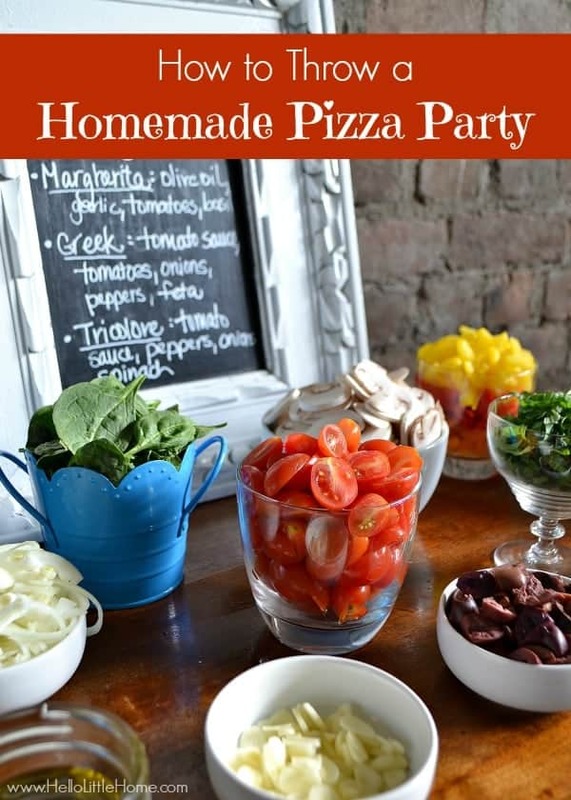 Now that you’ve learned how to throw a homemade pizza party, check some of my favorite pizza recipes!